If it wasn’t for this inane urge to write about nearly every restaurant in the Jackson area, I would rarely deviate from a list of four or five restaurants. Unsurprisingly that list consists of mostly Asian venues. Yes, Southern cuisine, pizzas, burgers, bbq, and all the other foods that Jackson has to offer are all well and good, but there’s nothing quite as comforting as the salinity of soy sauce, the numbing of Sichuan peppercorns, the blank canvas of steamed white rice, and the pungent fragrance of fish sauce…..I could go on for ages. Needless to say, when I hear about a new Asian restaurant in Jackson, I’m all ears. For anyone who drives on I-55, I’m sure they have noticed, at least subconsciously, the empty space that once held the Chuck-E-Cheese. Combined with the burned out shell of a restaurant in the parking lot, I figured that strip mall was just a few months away from being boarded up. Imagine my surprise when I noticed a sign that said a new Chinese grocery was coming soon. Well, a few weeks ago the promise of that sign came to fruition. With little to no patience, I stopped by the grocery after work and saw the word had quickly spread through the Asian community. Having been thoroughly impressed by the selection of the grocery, I was genuinely curious about the restaurant portion of this new Asian outlet. I had heard from the folks at Ding How that Mr. Chen’s was supposed to be a New York style Chinese menu, and I wasn’t quite sure what that meant. Did that mean Mr. Chen’s would feature the radioactive glow of General Tso’s Chicken or something a tad more authentic? Well, I convinced Alvin and Kate to meet me and see just what Mr. Chen’s had to offer on that opening weekend. Looking through the menu, I was genuinely impressed at they had to offer. From Tossed Jelly Fish in Sesame Oil to Mapo Tofu, it was dish after dish of things I never thought I would see in Jackson. However my jaw nearly hit the floor when I looked through the five item long section of Appetizers. There, inconspicuously nestled between Pan Fried Dumplings and Pan Fried Turnip Cakes was Small Steam Bun(10). I couldn’t believe it, soup dumplings in Jackson! The burlap was a unique touch. Most of the time I see lettuce or maybe some parchment paper, but the burlap was simple and effective. Once I got past the thick wrapper there was the familiar unctuous texture of hot broth and a pleasant nugget of pork filling in the middle. Served with a side of mushroom flavored soy sauce, these soup dumplings were surprisingly average. Still, since they’re the only game in town, they are the best in Jackson. 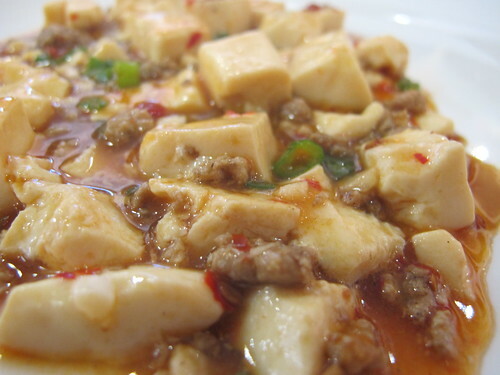 Ever since I began working my way through Fuchsia Dunlop’s cookbooks, I’ve cultivated a mild infatuation with Mapo Tofu. As a result, every time I see it on a menu, I have to try it; Mr. Chen’s was no exception. 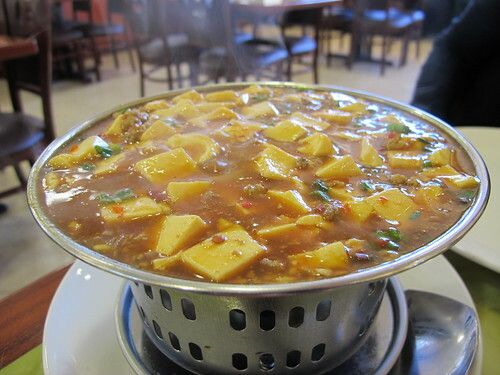 I rarely see this served over a sterno candle, but I can see the appeal of consistently hot Mapo Tofu; now I can burn my mouth with hot tofu throughout the entire meal. Along with the silky blocks of nearly molten tofu, there was a fair amount of ground pork and a pleasant combination of vinegar and spicy chilies. Unfortunately there was nothing in the way of “ma la” from Sichuan peppercorns. Even without that key feature, this was still a tasty way to eat tofu. With Kate’s ongoing experimentation in the world of vegetarianism that means there had to be at least one vegetable centric dish. 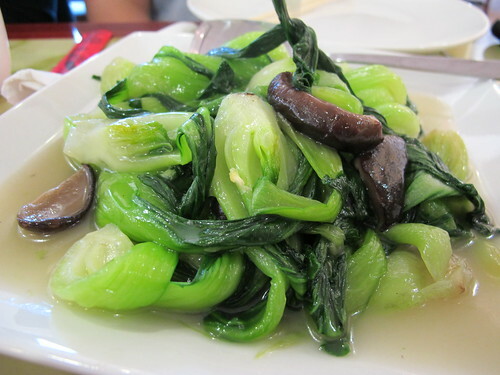 Enter an order of Boy Choy with Black Mushrooms. The preparation of this dish caught me completely off guard. The whole plate was watery, almost as if the boy choy and reconstituted black mushrooms had been thrown in a hot wok and then tossed onto a plate. Another odd feature was the size of the bok choy. Instead of trimming the baby bok choy to a manageable size, the bunches had simply been quartered. Despite these annoyances, this was still a pretty tasty way to eat your veggies. In another nod to Kate’s self imposed dietary restrictions, we needed a seafood dish. That’s actually quite a difficult choice at Mr. Chen’s. With more than 30 options in the seafood section, there’s something for nearly everyone. 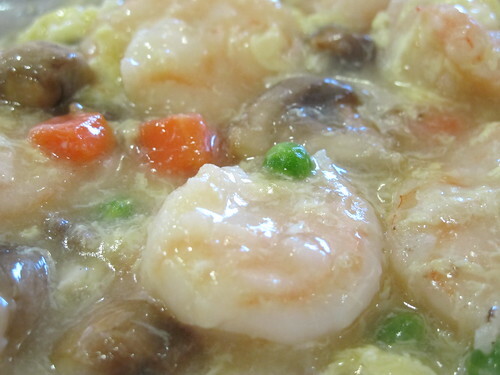 It may seem a little mundane but Shrimp in Lobster Sauce was irresistible. Thankfully this dish lived up expectations. 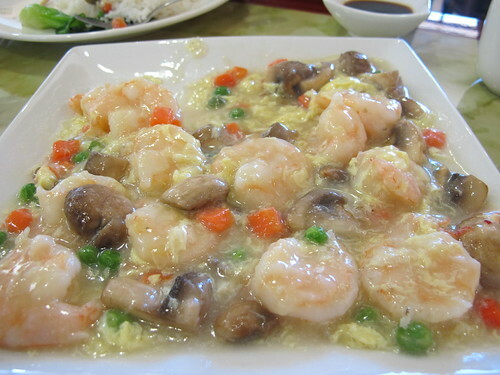 Each shrimp was plump & juicy, and the egg-laden sauce was highlighted by the unmistakable briny taste of lobster. 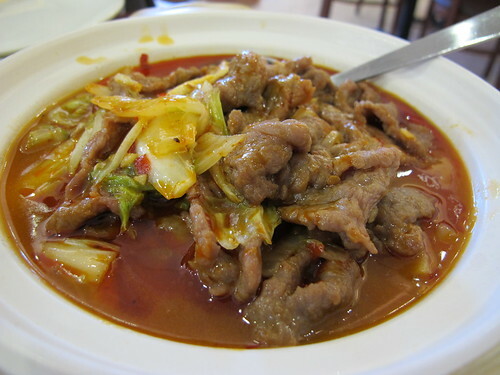 Our last dish was another Sichuan favorite of mine, Boiled Beef in Hot Oil. True to form, this was a make you sweat dish. 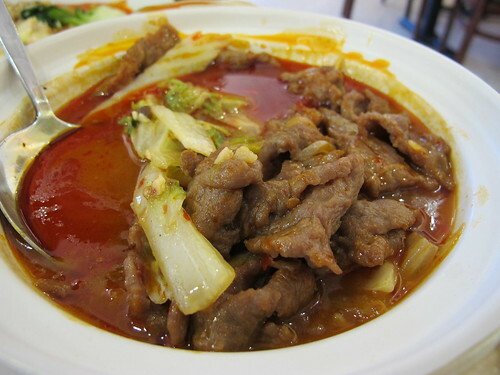 With tender cuts of beef, the oily, spicy sauce, and cabbage for textural contrast, everything worked quite well. If there was one downside to this dish, it was the conspicuously absent “ma la”. I love Boiled Beef in Hot Oil, but without the Sichuan peppercorns, this dish really falls flat. It’s staggering to think that there are multiple quality Chinese restaurants in Jackson now. Not only does the reinvented Ding How offer excellent Chinese food, but Mr. Chen’s makes a decent argument to join Ding How’s ranks. There were some major disappointments at Mr. Chen’s, but I’ve come to accept disappointment in my search for Sichuan cuisine in the Southeast. When it comes to the rest of the menu, Mr. Chen’s is an excellent addition to the Jackson restaurant scene. I’d like to delve a little deeper into the menu at Mr. Chen’s but I was pretty happy with my first visit, even if it was just due to the soup dumplings. do you think the xioa long bao could be frozen? Ate at Chef Liu's today and was wondering if they were homemade there...they seem to be a little too uniform. With the increase in popularity, I would think there are more frozen options available to restaurants. 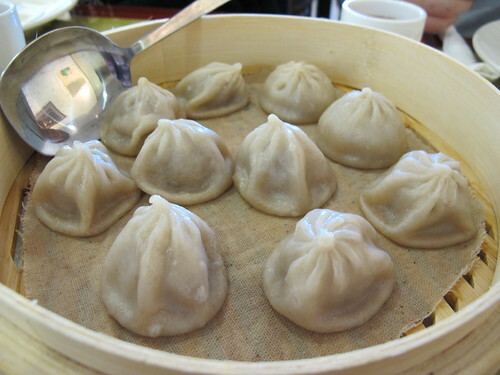 I know there are frozen xiao long bao that you can buy, but I've never actually seen them at a Chinese grocery. From what I've read the warning signs of frozen dumplings are a thick wrapper, uniformity, and a shiny wrapper. Going on those criteria, it looks like both Mr. Chen's and Chef Liu are prepackaged. I could be completely wrong but both dumplings seem have that top that looks like it was machine made. 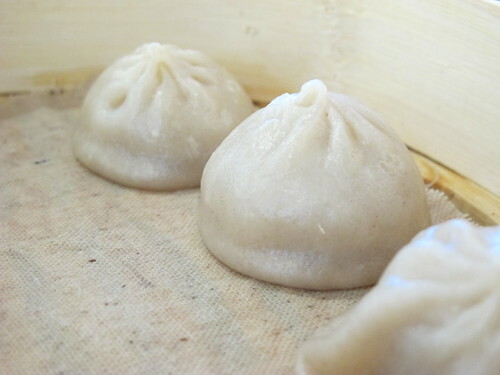 Speaking of Chef Liu's, did you xiao long bao lose all their broth? The one time I ate there, the dumplings stuck to steamer insert and I lost everything. Wow, I need to do a better job of proofing my comments before posting. I had them today and did not find the wrappers to be too thick. I am so glad to have a place like the Oriental Supermarket/Mr. Chen's in Jackson now.